1' wide and 11'' thick at the top, 13'' thick at the bottom. 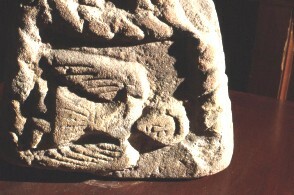 This panel has an angel with large wings set sideways, as though falling. Bu'Lock, J.D., Pre-Conquest Cheshire, 383-1066 1st, Cheshire Community Council, Chester (1972) Stones, Sculpture, Anglo-Saxons, England..